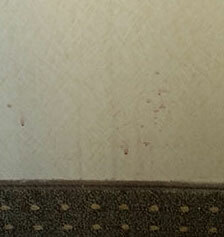 Park Place Hotel in Traverse City - Worst Room Yet! 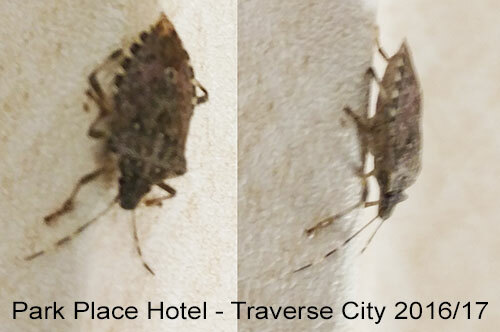 We stayed at the Park Place Hotel to bring in 2017 and see the Cherry Drop in downtown Traverse City (nights of 29th, 30, & 31st) and I have to tell you – it was by far the MOST DISGUSTING room we have every stayed in, ever! I know, the lobby looks awesome, Minervas restaurant is fantastic, but the room was something I’d expect from a low-end hotel! 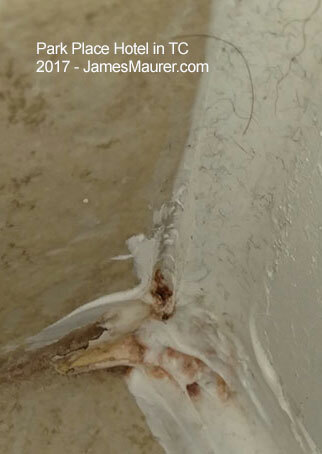 The first thing we spotted as we entered this dated room was a bug in the middle of the wall shown in the picture below – you couldn’t miss it! 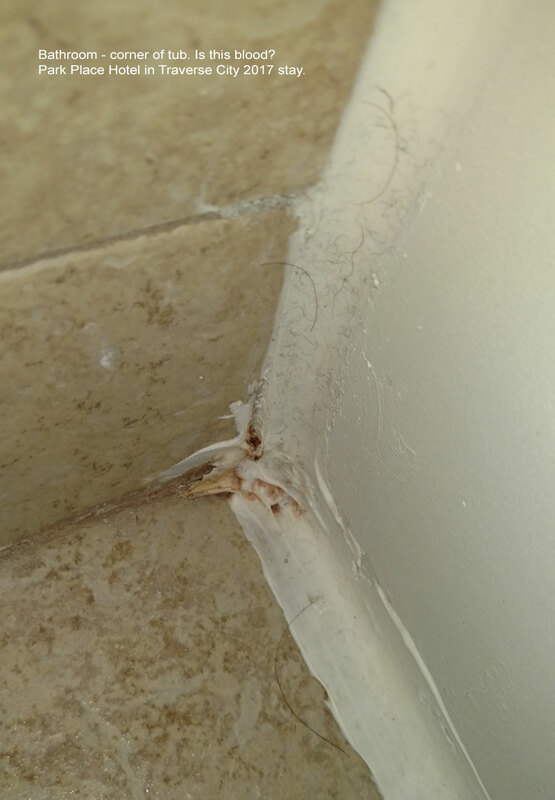 You might think that this is a bed bug but it is not and were later told it was a stink bug. Although it can emit an offensive smell, its sucking mouthparts do not feed on blood like the bed bug does. 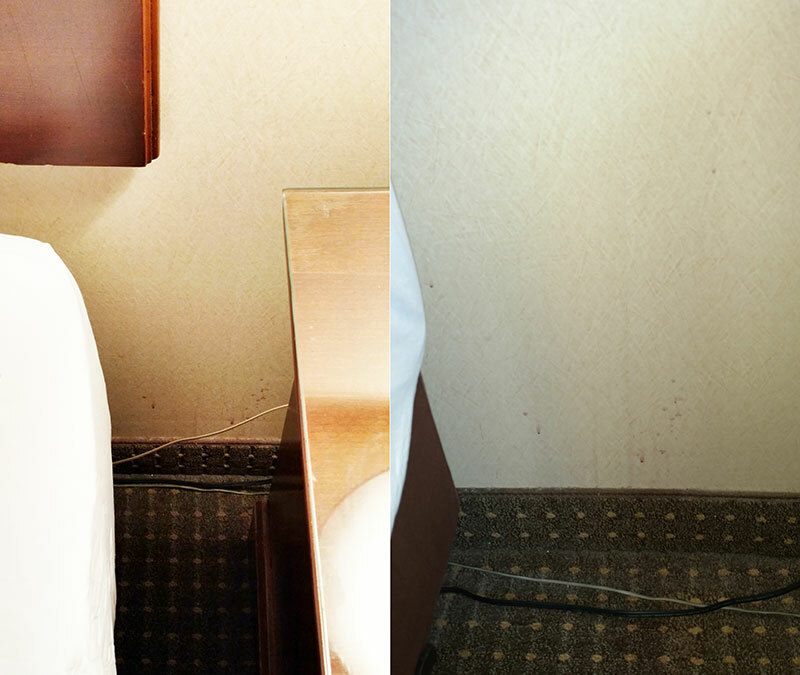 Worse, take a look at the wall (zoom in to see detail) – clearly not cleaned and in plain sight from the end of the bed. 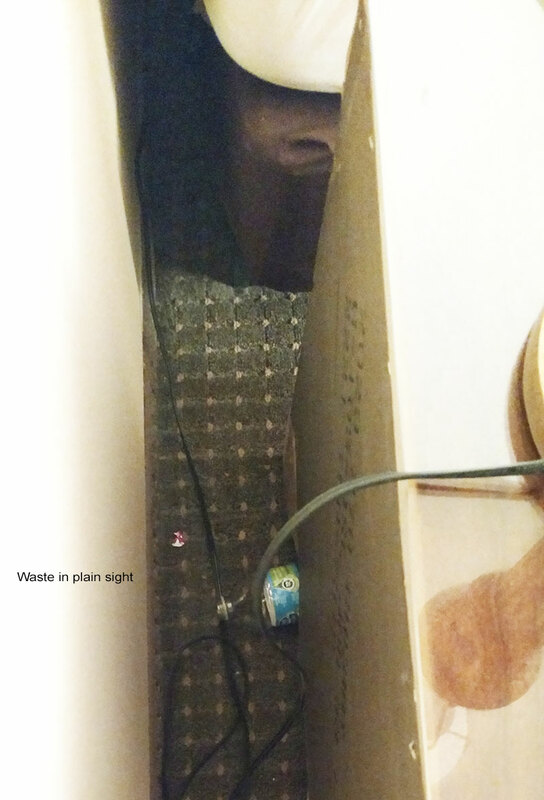 There is no way you should miss this if you were cleaning the room. We were asked if we would like the room checked which of course we said YES, and were given a $25 gift card to use at Minervas restaurant and bar located on the first floor while they check out the room. After our drinks were finished, an employee came to inform us that our room has been thoroughly checked and ready for us to unpack. 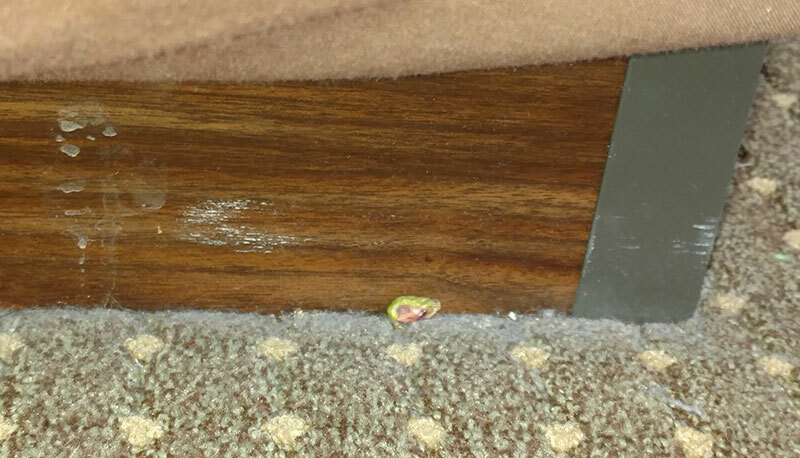 Then we noticed the filth on the floor and spotted what is shown in the picture below (zoom in for detail). What is that? Is that blood and pubic hair? You can clearly see this as you enter the bathroom and especially if you sit on the toilet! She then went to make a cup of coffee and found this! 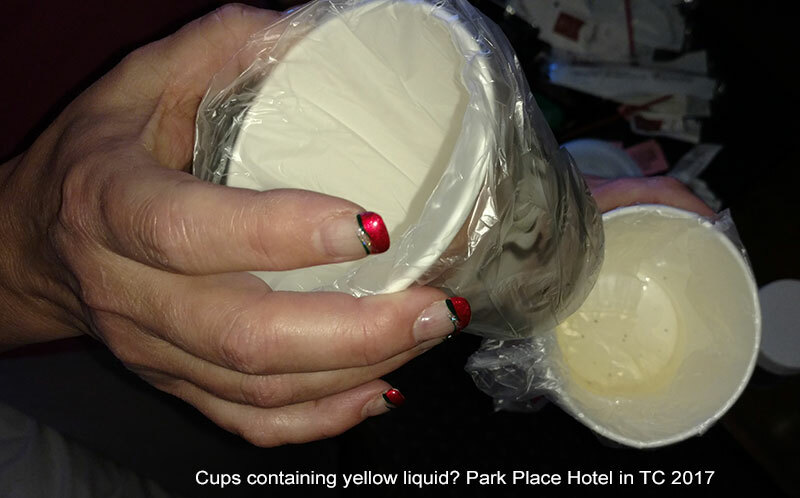 The cups were still wrapped in plastic but there was yellow fluid in the bottom??? This was just too much – we’re paying over a $1,000 for these two rooms (our daughter and her friend stayed in their own room) and we expect soooo much more. I went down to talk to the Hotel Manager Thomas Maloney. 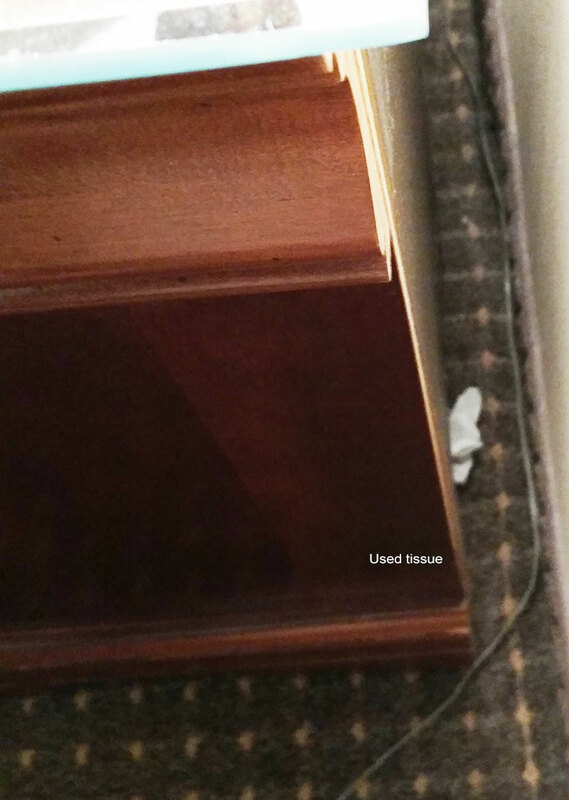 When I showed Tom the picture he acted like it was no big deal saying “it’s just an insect”, then when I told him about all the items wrong with the room, he downplayed those as well. Each item I brought up he downplayed with a “whatever” expression which obviously didn’t go over well with me. I told him I expect both rooms (425, 429) to be spotless when I get back – I was non-confrontational, didn’t ask for anything in return, but did let him know that this is by far the worst room we have ever stayed at in our lives! 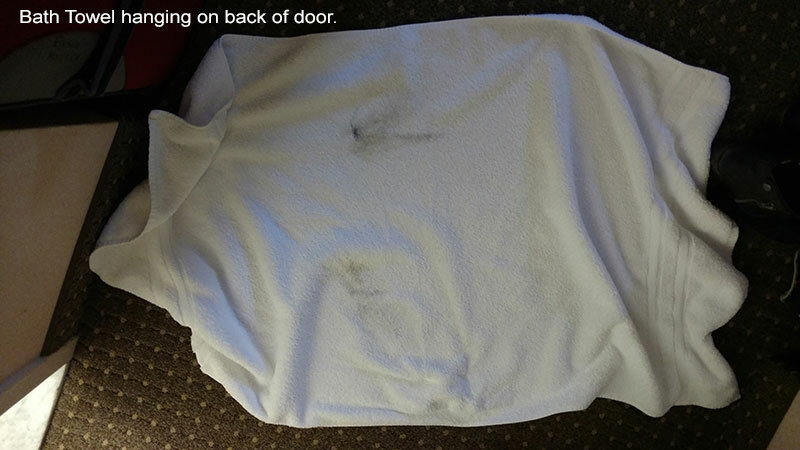 He said he would have housekeeping look into it right away. At checkout, we didn’t ask for anything, but received $50 off our $1,050 bill for the troubles. The hotel manager Tom Maloney never said anything to us, never apologized for the problems and I got the distinct feeling he could care less. He had us at one of the busiest times of year and I suspect he knew we couldn’t go anywhere else. Park Place Hotel has a display showing future renovations, but honestly, until they put some quality control measures in place, I doubt it will make a difference. I noticed that TripAdvisor’s most recent reviews included one from Dereck W claiming there was Feces on the toilet seat – I’m not surprised. 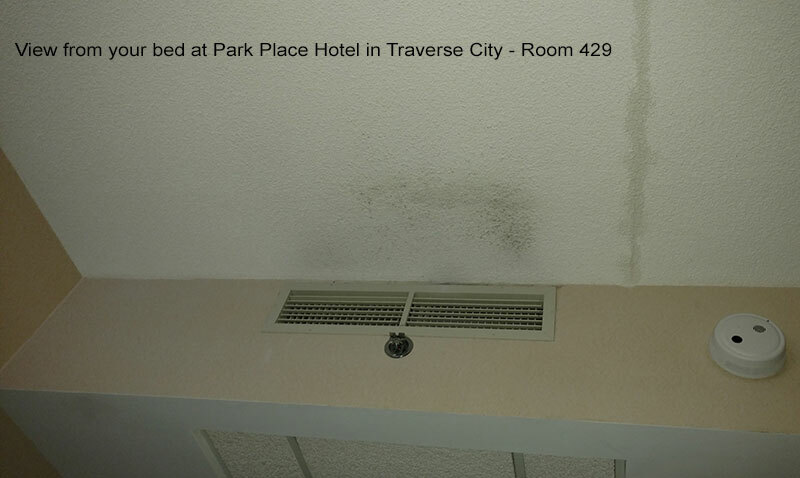 I would NOT recommend you stay at the Park Place hotel in Traverse City. It is by far the worst room we have ever had; if you decide to try it and have similar problems, I sincerely hope you don’t have to deal with Tom Maloney. Regency Hotel Management lists Park Place Hotel as one their properties at 300 East State Street, Traverse City, Michigan 49684 with a phone of (231) 946-5000.